Who needs a Berlin Interpretation anyway? Really cool concept and execution. I think the keyboard layout is a bit much. It makes the controls super hard when the pacifist run is probably already hard enough. Would be nice to have the difficulty come more from the scenarios rather than a control scheme that simpyl handicaps the player. Thanks a lot for playing and sharing an opinion. I think controls are integral to every game experience, in making it a crucial part of the game, that can be experimented with and express something. It reminds me of children, having hard time playing with arrows one handed, helping themselves. This is gaining game literacy, obtaining an ability to translate your will into an action in the game, driven by pure curiosity. I think my control scheme is an extension of that - we live in an age of comfy, normalized control schemes, for about 15 years. Taking your time to master an uncomfortable input method and make it familiar, your own, is usually a part of the game, I'm just doing it more extremely. That was a great game! Impressively done for just 48 hours. One thing I will say is that it doesn't work quite as well when your keyboard layout isn't QWERTY, but I recognise that I'm in the extreme minority. Still had fun though; it's like an extra layer of challenge. Man, pacifist run is very hard. The dudes who kill the other dudes are so rough. This gives me the same "I am so pissed off but I must keep playing" feeling. Quite nice! I was about to comment your game back, but then it turnt out, there's no game, your account only commented my game. What an honour! I want to play and comment more games but haven't had much free time, hopefully I'll get to it soon! Just got your jam version a rating! This is a smartly designed game. 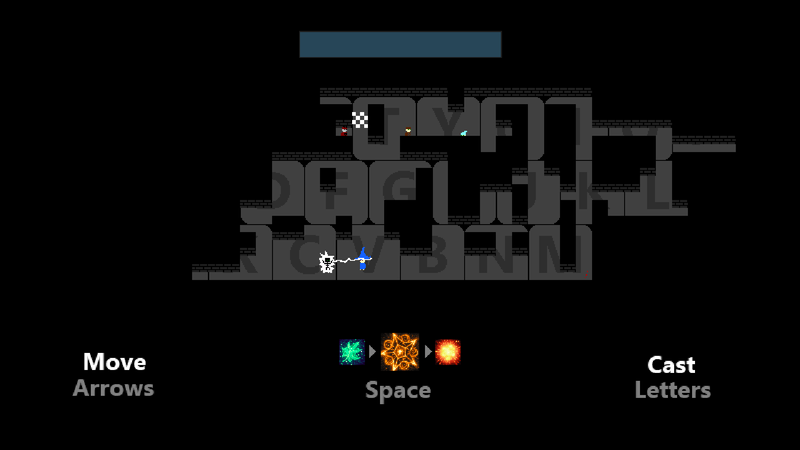 I love roguelikes, and you did a really nice job capturing the essence of them, but in reverse. The game gave me a feeling of tactically solving puzzles and problems, without the usual roguelike mechanics. It looks like others have already captured a lot of what I had to say, but something I haven't seen yet is the interesting phenomenon that this creates when you play through as a pacifist -- instead of the dungeon being your enemy, your own omnipotency is the enemy, since it's really easy to accidentally destroy the enemies. Yeah it's a little rough around the edges polish-wise, but I appreciate your core idea and the things that spun out of it. Thanks for making this. Thanks a lot for playing and understanding! Had a ton of fun. Reminds me of that other game that had keyboard controls in last jam, Keygeon or something. However, dying is nigh impossible, the explosive spell is super OP and are lacking advantages and disadvantadges, and it feels like your actions have no impact, whether you kill all of the enemies or run to the goal at every map. Then again, I haven't given the pacifist run a chance yet, so my review may be flawed. Still, the control method is pretty unique and the game is very neat - well done! Yes, dying is impossible, the explosive spell is OP if your goal is to kill people. Once you'll try solving the game in a pacific manner, you'll see there are downsides to the explosion spell, and that the other two are way more valuable. It was really excellent ! The art is cut and the gameplay succeed to be original, fun and even deep as it allows tackle an issue in different ways. The keyboard mechanism is well found as it add various challenge to the basic action ! For example, sometime only a part of the letter is visible and you have guess the letter with that. Alos, when you have to put a spell on a place that is hide, you have to compare your own keyboard with the key that appear on screen to find which key is hidden so it is a smart way to involve the player even for the basic actions. The game offer also an interesting way to discover its mechanism : at first, I was only using the fire as it was the most obvious power and the other powers seems useless, then when I understood that I should not killed, I started using the two other powers but felt the fire was useless and finally I understood that I could use the fire to create new path and started solved some room with the 3 powers. So I found very interesting how the game let the player discover the mechanisms gradually but yet naturally without tutorial. Very good job ! One of my favorite entry of this jam ! Thanks a lot for playing and interpreting it this deeply! very very cool game and game mechanics i can tell that there was much hard work put on this well done. you can go check out my entry it will be very nice from you to rate it and give a feedback because yo seem to be professional as it's my first jam i may have some advices. I'd check out your game anyway! Wow your creator of I Need Space, I Need Space was my favourite in 2 Color Jam. Also this game is nice. Really interesting mechanics. 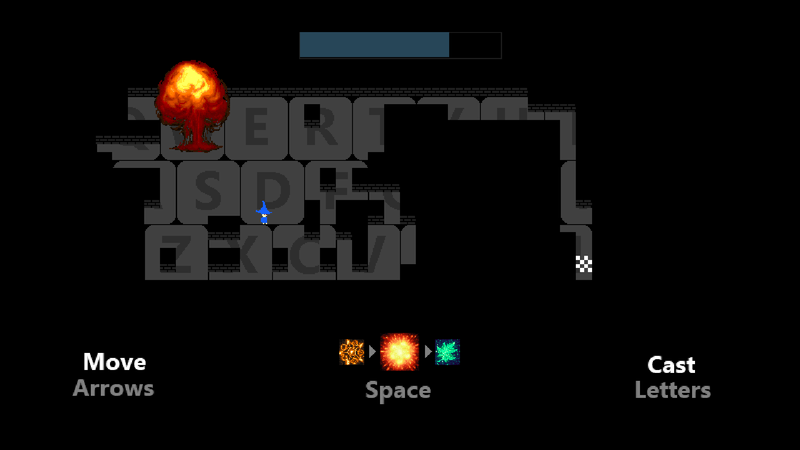 I really like how the dungeon has the keyboard map. The fact that you can cast spells before you move is neat. 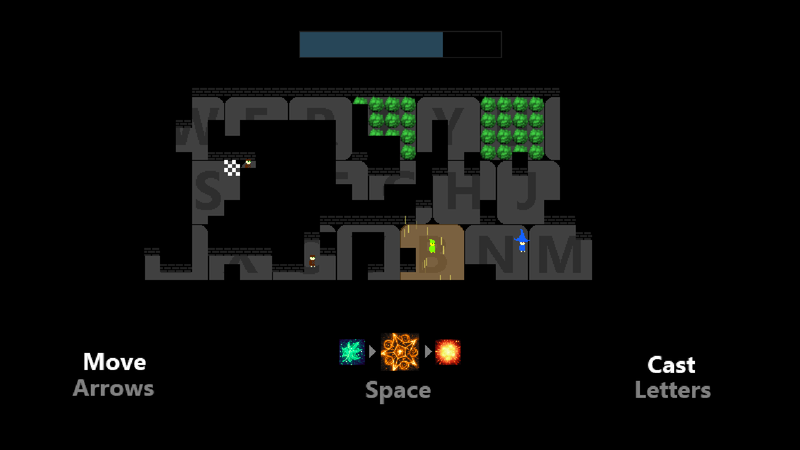 -survey the room, put forests where there are enemies, while still leaving room to get through to the finish. - I wish there was a bit more variation, but with the limited time, those 3 spells are enough. The ending is very undertale-esque. I liked that. It would be nice if the player knew upfront, but I suppose the game is short enough that its easy to jump back in once the goal is known. Great showing for the jam theme. cheers. Yeah, you've pretty much figured out how to efficiently get through a level, but even with that things can get tricky. It was my goal for the first playthrough to be a tutorial, I think I can do that since it's so quick. the main idea has a lot of potential but the poor game design makes it very confusing, the player should understand the rules of your games throught the game play, Mark explained that concept in his video about half life and megamman hidden tutorials. I liked the graphics and the 16bits sounds! goodluck! Well, and didn't gameplay teach you the rules? Do anything with enemies to kill them, go to the exit to win. Those are the rules. It's a matter of putting extra effort if you want the better ending, which isn't mandatory, it's just a more challenging and fun way of experiencing the game. I'm all defensive now, but in fact I want to know where exactly the bad design is, because you didn't point it out clearly. The other "attacks" are obviosly useless... When you're going for the bad ending. 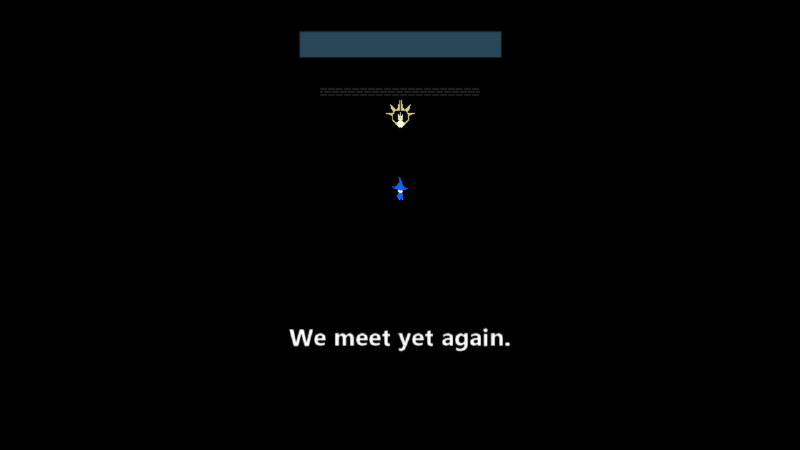 To get the good ending, you need not a single enemy to die during a run. To know that, you need to pay a little bit of attention during the bad ending and ask yourself - why are there those seemingly useless spells? You've had the clues before you the whole time. And once you start trying to get the good ending... Let's say the explosion spell becomes the least useful all of a sudden. it all make sense now, I guess i just didn't give it the time it deserves! It's in the spirit of roguelikes to have secrets, but I think the ending guy nagging you about your killings, and the whole fact that the game is suspiciously easy to get through should hint at the pacifist route. But you may be right, I may have made this too criptic for jam standards. Thanks a lot for the discussion! Very interesting concept! It's challenging, but it creates great puzzles. I really enjoyed it. Thanks a lot for trying ot out man! Very creative and interesting! I found it really interesting how in the initial playthrough you have no idea what you're doing. Perhaps if the game were expanded (more levels, longer, etc), it may make sense, both for gameplay and for storyline reasons, to start mid-journey, experience the strangeness and the "bad" ending, and then rewind time (or something) to the beginning. Overall, well done! Well, in my vision the game is short excactly for those reasons - the first playthrough is a careless tutorial, and then when you take the pacifist route, things get intense and you thank the divines that there are only 10 levels. This is a game that is indifferent to your actions, but you may care about it's output, making your actions matter. That's why the same rules are always applied, to give the freedom to do anything the player wants. Maybe someone will try and not kill anyone from the start, that would be interesting, and it's exciting as a possibility. 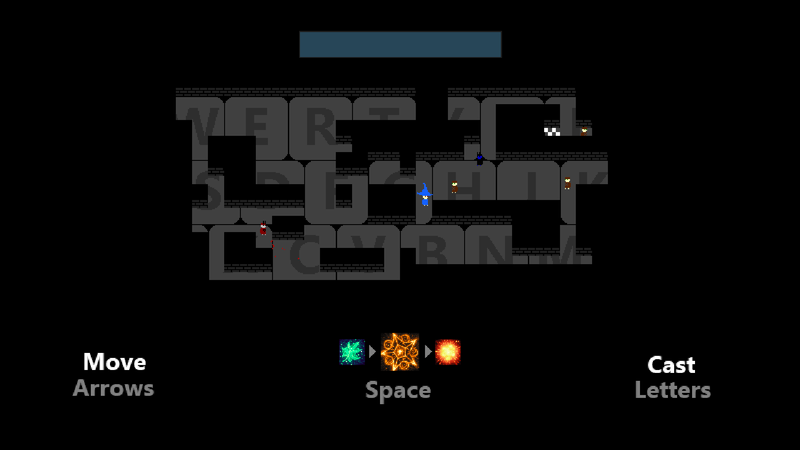 An unusual roguelike with (far) more deep than it looks at the beggining. You must totally play a second run. I started playing it without having sense of what I was doing, I felt that the twist to the genre was too obvious, and a bit without sense (like the thing that there was no permadeath). But after playing it... It started to make sense. I compared the game like a music album that you dont really get at first, but when you get in.... you love it. That's what happened to me with this. It's a super original roguelike with some stealth and puzzle elements. I hope you continue developing it, I consider it a little gem. Imagine more powers, enemies, etc. Would be awesome. Awesome job, hope it gets a nice score, 'cause it deserves it. 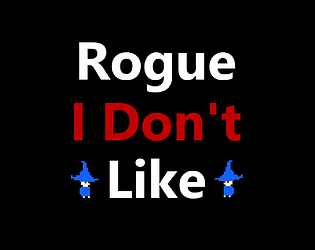 PS: Rogue I don't Like is a Rogue like I freaking Like. Thanks a lot for the overbearing positivity! I may continue to work on it a little more, we'll se about that, I can't tell at the moment. I think more powers would annoying to cycle through. More enemies is always good, I think of stuff like a guy that alarm everyone around or a guy that cuts through the plants to free fellow rogues. Very nice. You've made an interesting roguelike by defying every single convention there is. Unfortunately players don't realize how you're supposed to play until after you've done a full game, but that works with a game of this size. The first playthrough can last as short as 2 minutes and it can be seen as a tutorial - you'll know what to expect and will be fully informed when strategizing, when trying to get the better ending. That's a conscious decission I've made. Yes, there's also an ending for not killing anyone, which is hard, sadly sometimes almost impossible if you get a bad roll. Ah yeah, some of those I completely missed and didn't think of generic rouge-like having that this does differently. I also feel like there should be a third ending where you only killed a few. That one would be much easier to get and because it would likely be most common then people would be able to play it again going for the other two rather than just the other one so it accommodates more play styles in it's replay ability and just makes it more replay able too. Yes, or better, make the better ending more fair to obtain. The red enemies can ruin a run sometimes with no hope. It made my antvirus go crazy, i think you messed something or you made a virus. This is common for exe exports from GameMaker, just ignore it. I can't change it, it's engine specific. It sound you've tried to get the better ending. Did you succeed? Well, the sound was kinda slapped onto the game at the end, I rarely use headphones so I didn't notice, sorry.